CDs will be sent on receipt of orders which are accompanied by payment of the published price. Postage and packing is charged at ￥200 (incl. consumption tax)for a single CD but is free of charge for orders of two CDs or more. The Grand Master A. Segovia said to me one day, when I was studying with him, “The guitar is an orchestra but with a smaller sound size”. I was young, but I understood the basic truth of his statement immediately. It takes a long time for an artist to mature, however, and I see only now that this recording of mine, made 40 years ago - and ten years after my first meeting with Segovia - was the first tangible footprint of that glorious moment of artistic discovery. It was my attempt to give form and substance to what the great Maestro had taught me - a revelation which opened a window on a whole new world. It was also the beginning of my quest to give life and being to the magic of the Spanish classic guitar. I hope that students and others who share my wonder at the expressive capacities of this many-voiced instrument will be able to make good use of this CD for the development of their playing. Please take particular note of the range and quality of the tonal spectrum, which the guitar offers so eloquently, and which are so different in the high and low positions. Listen also for the dynamic range and the silences which allow the music to breathe and to enter the minds of those who are sensitive to its poetry. The guitar, when she is inspired, speaks to the secret places in the human heart. by Akinobu Matsuda, in collaboration with the famous music film director Christopher Nupen. I received following message from Mr.Chrstopher Nupen (one of the most famous music film director in the world), when I had sent him this CD. Your CD is a delight — and from several different points of view. The first is that it is a poetic evocation of the things which Andre´s Segovia discovered, invented and offered to the world with such touching results. The range of tone colours is glorious and, more importantly, it is always poetic and always in the service of the music. Of course, Segovia did not discover or invent all of it but he did make those things his own and he did make them a part of the classical music world for the first time. His achievement was monumental and this CD proves that you are a true disciple. Chapeau! I take my hat off to. Chapeau! There are three other things that I should say. The first is that your chords are wonderfully articulated; clean, accurate, pure and a true delight to the ear. The second is that it is a pleasure to hear so much music which I have not heard for such a long time. 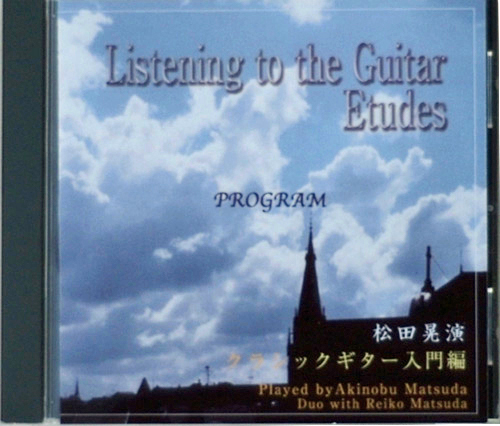 I had no idea that Reiko was such a good guitarist. Really no idea. And so I was profoundly impressed. Her playing is beautiful and sometimes I am not even sure whether it is Reiko or Akinobu. Please give her my congratulations, my compliments, my admiration and my thanks. I have already listened twice to the CD and will listen again. It is full of beautiful things. Thanks for sending me this disc. Following sentence is reply from Mr. Nupen for my request to put up the above on my web-Site. Yes, of course, and this reminds me that when I paid tribute to your range of tone colours --- and the way in which you use them --- I forgot to say the most important thing of all. That is to say, that no matter which tone colour you are using your sound is always good. It is always round, smooth and has a clear centre. And also in the chords. This is true of very few guitarists. I take my hat off to. Chapeau! 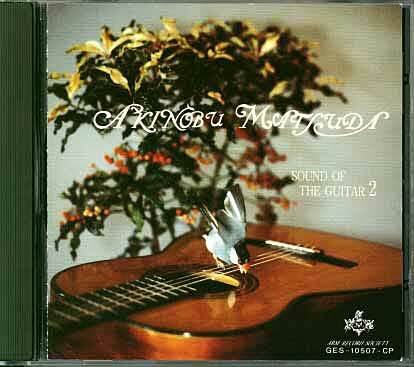 The copy of this CD is available at the following shop with some other CDs like "Sound of the Guitar 2,3,4,5". From the Overture "der Freischu¨tz"
Click on the picture to listen to some bars of a Gigue by J.S.Bach. "The CD arrived today. I have just listened to it. As you expected, I very much like your playing. It comes, unmistakably, from the Segovia tradition. I am not saying that it is an imitation of Segovia, not at all - but the wish to make the music speak personally is unmistakable and, to me, it is very appealing. What you do is not fashionable in music circles today but that does not mean that it will not appeal to the public which is not always governed by fashion. Keep going in your own way. It is a good way. Thanks for the pleasure of listening to you. I will listen again before I go to sleep tonight." All good wishes Christopher. "Sound of the Guitar2" & "Sound of the Guitar3" are also on sale. ￥3.000- (incl. consumption tax) each. 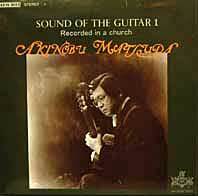 Matsuda Akinobu - A Poet in Sound. 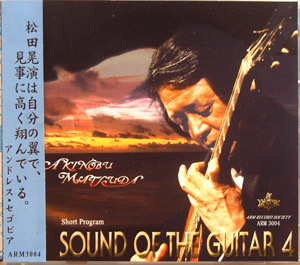 Bravo Matsuda, maestro di musica. You have become a poet of the guitar, a worthy follower of Segovia. For a few seconds, in several of the pieces, I noticed that your tempo is slower than what I am accustomed to hearing but I very quickly understood the reason when I heard what it is that your music is saying to the sensitive listener. I was particularly struck by the range of tone colour and the truly exceptional way in which you have succeeded in giving different colours to the treble and bass and, amazingly, at the same time. One of the things that delights me is that this is living proof of something that has always been very clear to me - and it is this. If a serious worker in any field remains humble in the face of the work and keeps his or her mind flexible and ready to learn, then that person learns something, as he or she goes along, which cannot be described but which is deeply impressive . I saw this very clearly in Segovia and my dear friend Nathan Milstein. Your playing has acquired that quality which comes from conscientious, inquiring experience and I send you the most heartfelt congratulations. =the world-famous Producer and director of films with Andes Segovia, Nathan Milstein, Jacqueline du Pre, Itzhak Perlman, Pinchas Zukerman, Vladimir Ashkenazy, Daniel Barenboim, Isaac Stern, Zubin Mehta and other internationally respected musicians. 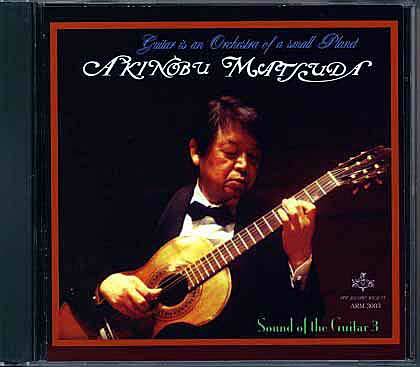 Click on the picture of "Sound of the Guitar 3", then you will hear a part of Prelude No.1 by Villa-Lobos of this CD or for all pieces, click on Omnibus Sample. Mr. Christopher Nupen, who has received many awards for his music films, of his direction and his production. He wrote to me as follows. “I received a major award last night, in London, for this film. It is an award which, last year, they gave to five people including Steven Spielberg and Roman Polanski so it carries a good deal of importance with it. This year they gave it to six people including Daniel Barenboim, Maxim Vengerov and Christopher Nupen. It is called the Jewish Cultural Award." "Sound of the Guitar 1"
SPANISH FOLK SONG arr. by Kitagisi & A.M.
For turther information please click here. I will respond with fuller details.